In this much-anticipated follow-up to the universally acclaimed first volume, NBCC Winner and preeminent cultural critic Gary Giddins now focuses on Crosby's most memorable period, the war years and the origin story of White Christmas. Set against the backdrop of a Europe on the brink of collapse, this groundbreaking work traces Crosby's skyrocketing career as he fully inhabits a new era of American entertainment and culture. While he would go on to reshape both popular music and cinema more comprehensively than any other artist, Crosby's legacy would be forever intertwined with his impact on the home front, a unifying voice for a nation at war. 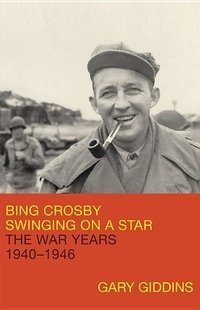 Over a decade in the making and drawing on hundreds of interviews and unprecedented access to numerous archives, Giddins brings Bing Crosby, his work, and his world to vivid life--firmly reclaiming Crosby's central role in American cultural history.